I'm a strong believer in continual learning and keeping abreast of one's field, not only because I like learning so much, but also because I know that a lack of learning leads to stagnation, boredom, and poor quality work. Most of the developers I know are also passionate about learning, and so they, like me, are always seeking to learn and discuss and debate and code. Even though we primarily function in the online space, there's nothing like doing all of that learning and engaging face to face -- so we love to attend conferences and off-site training. But conferences and training often mean travel and registration fees, and sometimes managers and executives can't see spending money on these things -- maybe they don't quite understand the importance of investing in their people, or maybe skill development doesn't seem necessary to support the business. In any case, it's up to you, the individual, to do some convincing. If you're in this situation, what can you? Research the event(s) you're interested in, gathering dates and locations, presenter bios, and comments from previous attendees. Craft a proposal which summarizes this research and presents a strong business case for you to attend. Will you learn skills relevant to an upcoming project? Will you build skills which could have made a recent project go more smoothly, and will also help in the future? Will you be exposed to industry or domain knowledge which will better serve your organization in some way? Link the event directly to your work. Summarize the costs, including registration, travel, and meals, and if you can, estimate the ROI. I think this is the part that scares people -- asking for money. But let me share a true story: In the first few years of my career, I never asked my bosses for training or conference money. I went to the classes they offered to me, and otherwise I requested time off to attend conferences on my own dime. Then my boss discovered that I was doing this. While he was thrilled that I was taking the initiative, he was concerned. (Was I planning on leaving? Did I think that I wasn't worthy of the investment?) At that moment he made me realize that just because I get a paycheck from my employer doesn't mean that their obligation to me ends there. He made sure I got my vacation days comp'd and reimbursed the training expenses, and from then on, I went to my bosses (and in grad school, my department chair/dean) with my conference and training requests. It's great if you happen to know how much budget your company/department/team has allocated for training, travel and events. But even if you don't, always start by asking for full funding of your training/conference registration and travel. If you're the only person going to the event, or if the event is somehow more associated with your role than someone else's, you probably have a stronger case for full funding. Be sure to ask early to ensure the maximum budget is available to you. But what do you do if your request is denied? If you really want to attend that event, don't give up! There are a variety of ways to get there, if you're willing to work for it. Try before you buy. If your organization is considering sending a group to an event or doing some on-site training, ask the boss to send you to assess the event or trainer before sending a whole team or bringing a trainer on-site. As a manager, I've made many a training and conference decision on the feedback of a few key individuals who were sent out to do reconnaissance. As a trainer, I've met many folks at conferences where we've discussed the needs of the organization and how I can help, which I think made it easier for the folks in charge to decide on hiring me later. Strength in numbers. Contact the event organizers and find out how many people you'd need in order to get a group discount. Then rally a group of coworkers around the idea of attending, and convince the boss to send a group. Yes, more people makes it more expensive, but more people asking places greater emphasis on the need for someone to attend and bring the knowledge back to share. Volunteer. If you're trying to go to a conference where volunteers are needed, you can usually get free admission if you volunteer. Or, if you have a large blog or Twitter following, ask the event organizers if they will give you credit for referring others to register for the event; that credit may cover part or all of your registration fee. Ask for partial funding. If you can come up with part of the funding (like travel costs) then ask your boss to support you by paying the rest (like registration). Again, if you have a large following on your blog or Twitter, you may be able to solicit donations to help cover costs. In either case, share in the goodwill by promising to share what you learn afterwards. Finally, if you must: send yourself. If you can afford to pay your own way, sell your boss on letting you go -- without having to use vacation time. At this point I'd say that you're going for your own personal development and you needn't commit to sharing what you learn when you return. However I'd also caution you to not be stingy -- if do share what you learn, you're making a better case to be funded in the future. 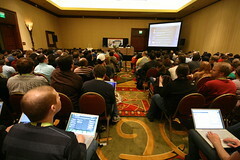 What other approaches have you used to get funding to attend conferences or training? Have you tried these techniques only to still be rejected? Please share in the comments so we can all learn.